For some parents the scariest part of Halloween is the prospect of all the candy their children will consume once they’ve brought home their haul. It may be hard to swallow but once upon a time candy was not the unhealthy villain it is viewed as today. By the 1930’s nutritionists called it a miracle food as important to the body as coal or oil is to the furnace, and conscientious moms made sure Americas youngsters had adequate supplies of this energy producing treat. 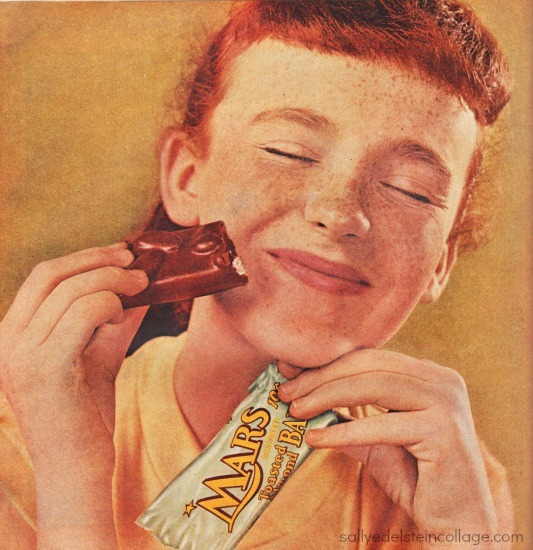 By WWII candy’s place in the diet had been firmly entrenched. Home Economists – especially those in the employ of candy manufacturers – were quick to point out the nutritional value of candy aiming to show candy as good wholesome food. And good ol American corn syrup helped make it extra special healthy and wholesome. The only surprise was this particular ad from 1943 touting the same sweet sentiments was from less than wholesome beer brewery Anheuser Busch. “Nature has her own way of telling us there is energy in sweets,” the cloying copy begins . 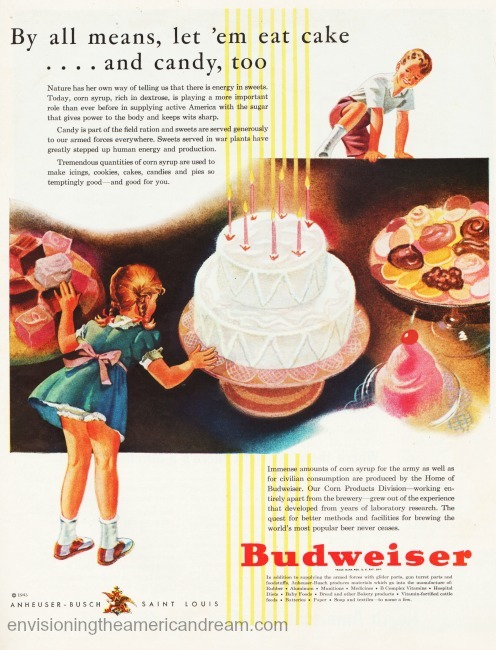 “Tremendous quantities of corn syrup are used to make icings, cookies, cakes, candies and pies so temptingly good- and good for you,” explains Anheuser Busch a major supplier of corn syrup during the war. The Beer company began producing corn syrup as a result of Prohibition which made it illegal to manufacture and sell alcohol. Using its grain supply it began selling barley malt syrup, soft drinks and then started producing corn syrup, a key ingredient in candy manufacturing. “Immense amounts of corn syrup for the army as well as for civilian consumption are produced by the Home of Budweiser. Our corn Products Division grew out of the experience that developed from years of laboratory research,” the copy claims. And once the kiddies got old enough, they could get their fill of corn syrup in an ice-cold Bud too! The rememberedsummers.wordpress.com blog just posted a Karo ad from 1930 (Doctors recommend Karo for children) and linked to your post.